"When they were approaching Jerusalem, in sight of Bethphage and Bethany, close by the Mount of Olives, he sent two of his disciples and said to them, ‘Go off to the village facing you, and as soon as you enter it you will find a tethered colt that no one has yet ridden. Untie it and bring it here. If anyone says to you, “What are you doing?” say, “The Master needs it and will send it back here directly”.’ They went off and found a colt tethered near a door in the open street. As they untied it, some men standing there said, ‘What are you doing, untying that colt?’ They gave the answer Jesus had told them, and the men let them go. Then they took the colt to Jesus and threw their cloaks on its back, and he sat on it. Many people spread their cloaks on the road, others greenery which they had cut in the fields. 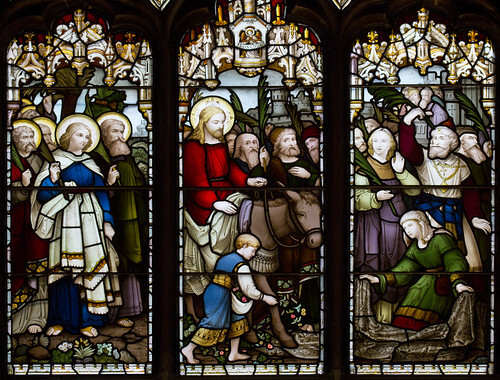 And those who went in front and those who followed were all shouting, ‘Hosanna! Blessings on him who comes in the name of the Lord! Blessings on the coming kingdom of our father David! 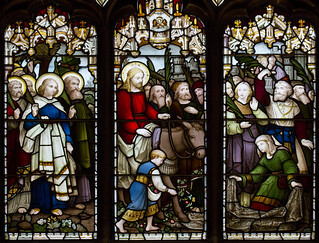 Hosanna in the highest heavens!’"
Today is Palm Sunday of the Lord's Passion, and this stained glass window is in St Giles' Cathedral, Edinburgh.